As I look back on my childhood, growing up on the Rideau Canal in Ottawa, Canada, those were the best summers ever. Lazy sun-filled days, sitting out on our small patch of real estate we called “Ski Beach.” Who knows who really owned the property, but it was our slice of paradise for years. Afternoon summers were spent skiing on the Rideau River between the locks with friends, behind anything that would go fast and float. You know, we had it good, really good. No sense of time, other than when the sun started to fade, and it got too dark to be out on the water, which led to grilling hot dogs around a campfire on the banks of the river and cheap beer shared with friends. The only money we ever spent was keeping the cooler full and paying the lock station staff with a six pack to pass through. We all would eventually make it home at night, just to start the party back up the next afternoon. Play. Rewind. Play again. Those glory days are long gone; I’m not even sure I would want to try to go waterskiing now, as I might end up breaking a hip. But the memories are so ingrained in my mind. This is what helps me sleep at night: thinking back when times were so simple and life was just plain fun, hanging out with my best friends, known as those crazy bunch of river rats! Even the local Ottawa River Patrol not only put up with us, they actually loved us and often would hide their own patrol boats behind our ski boats on the river banks for a quick break, as we offered a great amount of entertainment during those long hot summer days. So, fast forward almost a half century to another time. Ummm, it’s called reality, and last summer we decided to take a road trip back up north to Ottawa. I spent four years building my dream power machine with her 220-hp velvet drive encased in the sweet Philippine mahogany Speedster. It’s nothing like my childhood beloved ski boat The Fine Line, but we trailered her 10 hours north of Annapolis and launched her back at my old stomping grounds at Black Rapids Lock Station on the Rideau. Talk about déjà vu. It had been more than 40 years since I had been out on that river. I cruised up and down and up and down the river over and over again—and there she was, in a patch of overgrown sea grass, our famous “Ski Beach” picnic table. The wood was a bit dilapidated, but she was still holding strong. I could not believe she had survived all these years. “Ski Beach” was gone now; the river was so high that there was no patch of that tiny 10- by 20-foot silky patch of sand to be found. After all these years, I felt I had finally come home to visit an old friend. But this time I was cruising in pure classic style. 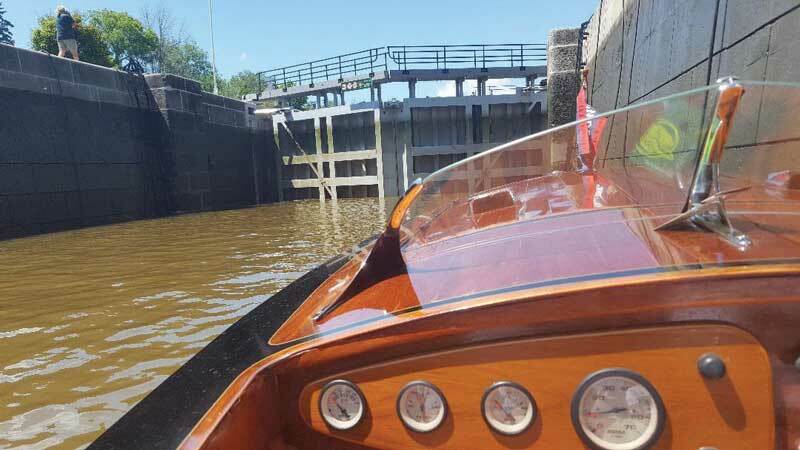 A true jewel on the river, my 1935 Gar Wood Speedster 16 that I had spent four years building from a set of paper plans purchased from the Antique Boat Museum up in Clayton, NY. I must admit we did look good. Everyone was whistling and waving as we cruised by. It was almost surreal. Here I was, getting all the attention on the entire river; back in the day, we were always the center of attention, too! Some things never do change. I had finally made it back, a tad bit older and much wiser (but still young at heart) and was reliving my treasured childhood memories. The joy I had felt as I cruised along the Rideau River banks was something I just can’t explain. Here I was, pointing out my best buddy’s family houses up on the banks. But the only thing you could really see were the small floating docks and the super-steep, overgrown, rickety stairwells winding their way to our old houses. My fondest memory, of course, was hauling the heavy beer coolers down to the docks each day. The worst was carrying the 20-gallon gas tanks down (when gas cost 24 cents a litre)—you had to have one in each hand, just to keep your balance so you wouldn’t slide down the steep set of steps. The floating docks reminded me of our classic ski boats names like Money Pit, The Falcon, Aldonza, Bacchus, and River Pizza (you can guess what that one meant). We hope this article brought a smile to your face, as you reflect back on your own childhood memories of growing up on or near your favorite body of water. It really was the best time of our lives. Cheers to all the river rats still out there, and keep those memories fresh in your minds! 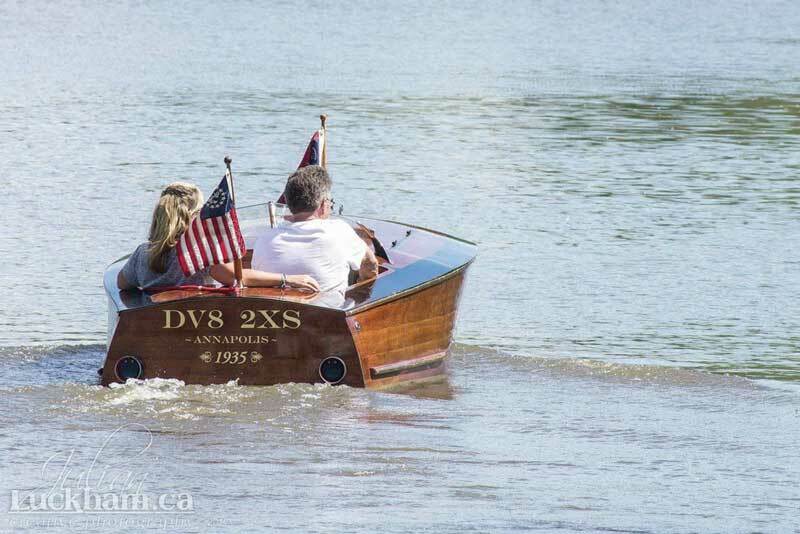 About the Authors: Ann and Dave Hannam own Classic Watercraft Restoration, a wooden boat restoration and custom small wood boat repair shop in Annapolis.